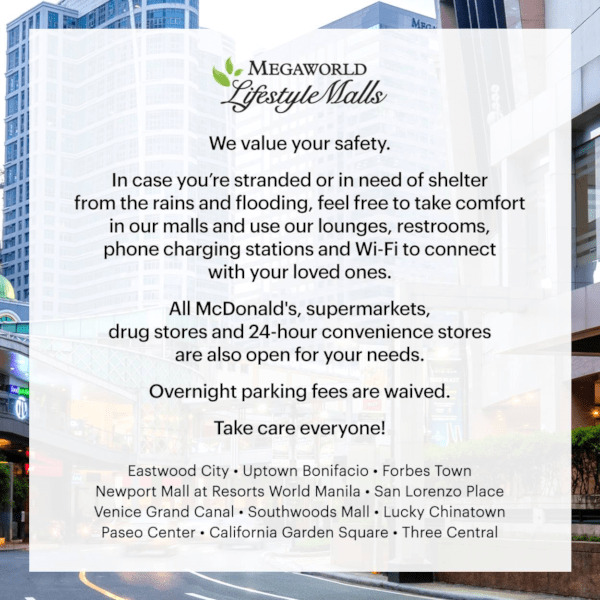 For the mallgoers who find themselves stranded during the Typhoon Ompong, Megaworld Lifestyle Malls have just announced that they will be opening their doors to those who are stranded and are in need of shelter because of the rain and flooding. 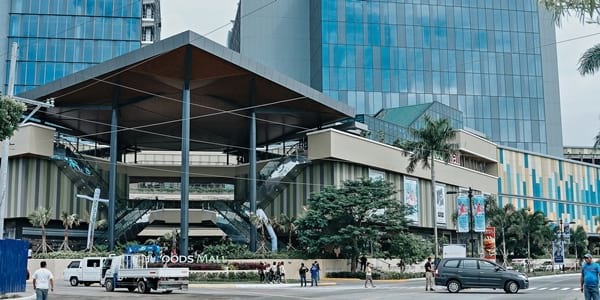 The public may also use the malls' lounges, restrooms, phone chanrging stations, and Wi-Fi to connect with their loved ones. Furthermore, McDonald's, supermarkets, drug stores, and 24-hour convenience stores will also be open for their needs. Overnight parking fees will also be waved. McDonald's, Robinsons Supermarket, Southstar Drug and 24-hour convenience stores are all open for your needs. Overnight parking fees are waived. ​McDonald's, Marketplace by Rustan's, Robinsons Supermarket, Watsons, Southstar Superdrug, and 24-hour convenience stores are all open for your needs. ​McDonald's, Robinsons Supermarket, Watsons, Southstar Drug and 24-hour convenience stores are all open for your needs. Overnight parking fees are waived. ​McDonald's, Metro Gaisano, Mercury Drugstore and 24-hour convenience stores are all open for your needs. Overnight parking fees are waived. ​McDonald’s, Marketplace by Rustan’s, Watsons, and 24-hour convenience stores are all open for your needs. Overnight parking fees are waived. You may check out the Megaworld Lifestyle Malls' official Facebook page for more information.